Eggplant lends itself especially well to breading, because it slices cleanly and is firm enough to withstand the handling that comes with the traditional flour-egg-crumb breading technique. If you're fresh out of eggs or eschew them for dietary reasons, suitable substitutes are probably within reach. Ingredients with a neutral or mild flavor are the best direct substitute for eggs taste-wise. Brush or dip floured eggplant slices in melted butter, olive oil or milk before pressing them into breadcrumbs. Press the crumbs onto the eggplant with your fingers to help them stick. The resulting crust will be somewhat delicate, so handle the eggplant with care. 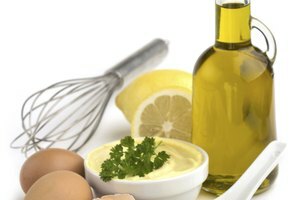 Thicker, stickier substances that are slightly more egg-like in viscosity include yogurt, heavy cream, buttermilk and mayonnaise, but keep in mind that mayonnaise does contain eggs. Use any of these and the breading will likely be substantial, as the products will pick up and hold a heavier layer of breadcrumbs. Choose dips, sauces and condiments with stronger flavors if they complement the eggplant dish you are preparing. Spread eggplant slices with pesto or marinara sauce before pressing them into breadcrumbs. Do the same with tahini or hummus -- thinned with lemon juice or olive oil, if necessary -- for a Middle Eastern version. Other flavorful options include mustard, hoisin or oyster sauce, a sriracha-mayonnaise blend or your favorite salad dressings, such as ranch, honey-mustard and vinaigrettes. Some of the options above are suitable for a vegan diet, and you can also purchase vegan versions of mayonnaise, yogurt and milks, such as soy milk and almond milk. Egg replacer is another option. Other vegan standbys are coconut milk and flaxseed meal mixed with water. After mixing and waiting for a few minutes, the flaxseed becomes gelatinous and remarkably similar in viscosity to beaten egg. 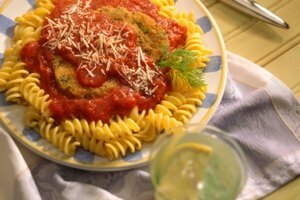 The classic technique for breading foods starts with three bowls -- the first with seasoned flour, the second with beaten egg or an egg substitute, and the third with breadcrumbs. 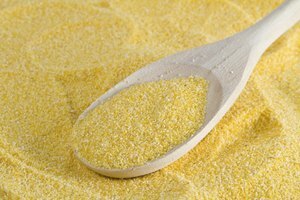 The last bowl may contain regular or seasoned breadcrumbs, panko, cornmeal or crushed breakfast cereal. Dust the eggplant with flour and shake off any excess. This fine flour coating gives the egg substitute something to cling to. Transfer the eggplant to the bowl of egg substitute and turn it over several times to thoroughly coat it on every side. Use your fingers or a fork. Move the sticky eggplant to the bowl of breadcrumbs and turn it over several times, using your fingers or a fork to gently press the crumbs onto the surfaces. Refrigerate the breaded eggplant pieces for at least 30 minutes, if possible, to help the crumb coating firm up and better stick to the eggplant. Deep-fry, shallow-fry or bake the breaded eggplant. Many eggplant recipes advise you to liberally salt raw sliced eggplant and let it sit for at least 30 minutes before continuing with the preparation. This technique draws water out of the eggplant, which is supposed to reduce bitterness and cut down on the amount of oil it absorbs while cooking. Do not be concerned about the bitterness factor -- today's eggplants have been selectively bred to be naturally much less bitter than their predecessors. The absorbency factor, however, might compel you to try the salting technique, especially if you intend to deep-fry the breaded eggplant. This advice applies only to globe eggplants, and not their more slender Japanese cousins or other varieties.